Dyson launched the Cyclone V10 cordless vacuum in 2018 – it was so powerful that is convinced James Dyson to stop making corded ones. In 2019, though, the British company may just have outdone itself. Only a year after launching the V10, Dyson has announced the release of the latest iteration of its cordless stick vacuum. The Dyson V11 looks pretty much like its predecessor, but ups the cleaning ante with a better battery and more suction power than the Cyclone V10. The V11 clearly reveals Dyson’s capability to take innovation to new levels, leaving us to wonder what else the company could have up its proverbial sleeve. The innovation begins with the new High Torque cleaner head that has the ability to sense different surfaces. The cleaner head is able to detect brush bar resistance up to 360 times a second. 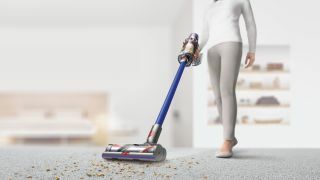 This is then communicated to the motor and battery microprocessors, resulting in changing suction power as the vacuum glides between hard floors and carpets, thus removing the need to change cleaner heads for different floor types. And while the motor is similar to that of the V10’s, the new V11 motor contains a triple diffuser to reduce sound and vibrations. It also spins at a whopping 125,000 revolutions per minute and ups suction power by 20% over the Cyclone V10. Although the V11 shares a similar design to the V10, the addition of an LCD display on the top of the vacuum is a welcome addition. There are three battery modes to choose from – auto mode, boost mode and eco mode – and your chosen power mode will be displayed on the screen, along with performance information and remaining run time. The display will also let you know when it’s time to change the filter and, if it’s not connected properly, will throw up a notification for that as well. If there’s an airway blockage somewhere, the screen will provide details on how to get rid of it by playing a demo of how to take the vacuum apart. The filtration system comes with rubber seals to capture microscopic particles, while a wand clip allows you to store the accessories – like the crevice and combination tools – on the vacuum itself. To top it all off, the bin is 40% larger than before. Put all this together and you’ve got a vacuum cleaner that promises the best clean you can get for your home. That kind of clean, though, comes with a price. The Dyson V11 is launching with a starting price of $599.95 / £499.99 / AU$1,099. However – just to throw some confusion (excitement?) into the mix – the American, European and Australian markets get different models of the V11. The US gets two variations of the V11, both shipping with the High Torque cleaner head, the combination and crevice tools, a mini soft dusting brush, mini motorized tool, a stubborn dust brush and the wand clip. In the UK, too, there are two versions to choose from, both of them shipping with combination and crevice tools, a mini soft dusting brush, mini motorized tool, a stubborn dust brush and the wand clip to hold them all together. Australia gets to choose between three versions, all of them shipping with the High Torque cleaner head, the combination and crevice tools, a mini soft dusting brush, mini motorized tool, a stubborn dust brush and the wand clip to hold them all together. The new Dyson V11 is available to buy direct from Dyson's own site.